According to Beanie Wells, the Cardinals will have their starting running back ready for action tomorrow against the Vikings. “I’m playing,” Wells declared. Whisenhunt also weighed in with a slightly more thought out prognostication of Wells’ status. Whisenhunt revealed that Wells picked up the tempo during Friday’s practice without any additional swelling. 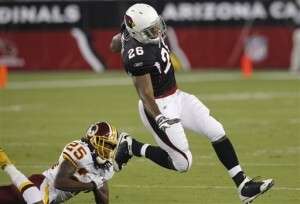 If Wells remains free from any additional swelling by gametime, which the Cardinals beleive will be the case, he’s a go. It’s a good thing, too. The Cardinals will need a strong effort in the running game this week, whether that comes from Wells, Tim Hightower, LaRod Stephens-Howling or a combination of all three, which might be the most likely. Linebacker Clark Haggans is the only player listed on the injury report that will likely not see the field this weekend. Will Davis should once again start in his place. Davis turned in a pretty good effort in Haggans’ stead, recording one sack for a loss of 14 yards on a key third down late in the fourth quarter.